Business, commercial and industrial customers with bulky, non-compactible wastes such as paper, sawdust, wooden crates and many other materials are effectively serviced by roll-off container systems. Please contact our offices to set up roll-off service. 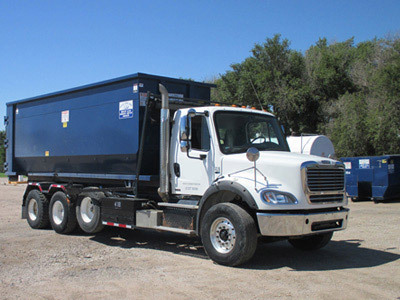 The high-capacity steel boxes used in this waste collection system can be hand-fed with large 7-foot rear doors that will accommodate fork lifts for depositing extremely bulky or heavy materials. 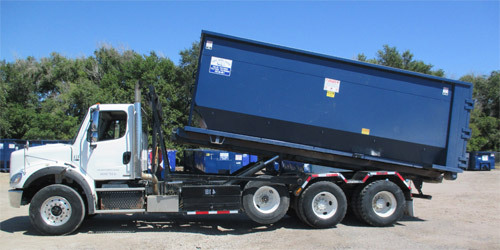 Full roll-off containers can be hauled and returned or replaced with an empty one by Northend Disposal on a predetermined schedule or on an as needed basis. Roll-off container designs are available as open-top units, closed compaction units and skid-mounted tank or vacuum units. A variety of other heavy-duty services are also available for customers that generate large volumes of waste. *Note: If you need service in these counties, please call 620-227-3371 for details. *Note: Only 20 yard roll-offs will be provided for asphalt roofing as well as concrete and dirt jobs.